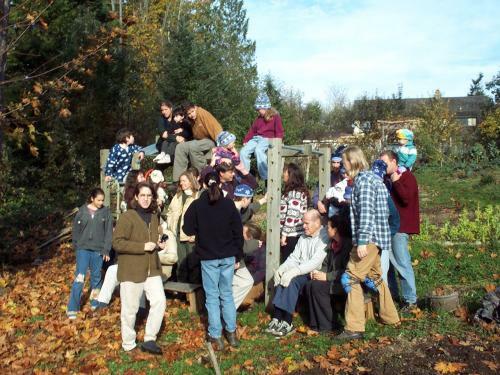 Wise Acres is a cohousing community of nine member households. We are comprised of teachers, programmers, artists, farmers, cooks, entrepreneurs, and craftspeople. We are children, adults, elders, and pets. Each member household owns title to a 1/3-acre lot, as well as an equal share in the 13-acre forested greenbelt, large and abundant organic garden, orchard, hot tub, sauna, community house, etc. We also have several rental options - a yurt, 2 1-bedroom attached apartments, 1 2-bedroom detached ADU, the more options currently under development. Please contact us to see what might be available currently. The group shares dinners twice each week, regular meetings, and spontaneous trips to local mountains, movies, beaches, etc. There are no required political or spiritual affiliations. We are individuals and families inspired by the riches gained by committing ourselves to actively participate in community.